Daily high temperatures increase by 4°F, from 29°F to 34°F, rarely falling below 16°F or exceeding 46°F. Daily low temperatures increase by 5°F, from 15°F to 20°F, rarely falling below 0°F or exceeding 32°F. For reference, on July 27, the hottest day of the year, temperatures at Halifax Stanfield International Airport typically range from 60°F to 75°F, while on January 30, the coldest day of the year, they range from 14°F to 29°F. Lent’ekhi, Georgia (4,876 miles away) and Tomakomai, Japan (6,201 miles) are the far-away foreign places with temperatures most similar to Halifax Stanfield International Airport (view comparison). The month of February at Halifax Stanfield International Airport experiences essentially constant cloud cover, with the percentage of time that the sky is overcast or mostly cloudy remaining about 62% throughout the month. The highest chance of overcast or mostly cloudy conditions is 63% on February 23. The clearest day of the month is February 9, with clear, mostly clear, or partly cloudy conditions 39% of the time. For reference, on April 28, the cloudiest day of the year, the chance of overcast or mostly cloudy conditions is 63%, while on September 3, the clearest day of the year, the chance of clear, mostly clear, or partly cloudy skies is 60%. A wet day is one with at least 0.04 inches of liquid or liquid-equivalent precipitation. At Halifax Stanfield International Airport, the chance of a wet day over the course of February is essentially constant, remaining around 26% throughout. For reference, the year's highest daily chance of a wet day is 32% on December 16, and its lowest chance is 24% on August 31. Over the course of February at Halifax Stanfield International Airport, the chance of a day with only rain increases from 8% to 12%, the chance of a day with mixed snow and rain remains an essentially constant 8% throughout, and the chance of a day with only snow decreases from 9% to 7%. The average sliding 31-day rainfall during February at Halifax Stanfield International Airport is essentially constant, remaining about 1.5 inches throughout, and rarely exceeding 3.2 inches or falling below 0.4 inches. The lowest average 31-day accumulation is 1.4 inches on February 7. The average sliding 31-day liquid-equivalent snowfall during February at Halifax Stanfield International Airport is essentially constant, remaining about 1.0 inches throughout, and rarely exceeding 2.1 inches or falling below 0.2 inches. The highest average 31-day liquid-equivalent accumulation is 1.0 inches on February 1. Over the course of February at Halifax Stanfield International Airport, the length of the day is rapidly increasing. From the start to the end of the month, the length of the day increases by 1 hour, 18 minutes, implying an average daily increase of 2 minutes, 53 seconds, and weekly increase of 20 minutes, 11 seconds. The shortest day of the month is February 1, with 9 hours, 48 minutes of daylight and the longest day is February 28, with 11 hours, 6 minutes of daylight. The latest sunrise of the month at Halifax Stanfield International Airport is 7:33 AM on February 1 and the earliest sunrise is 40 minutes earlier at 6:53 AM on February 28. The earliest sunset is 5:21 PM on February 1 and the latest sunset is 38 minutes later at 5:59 PM on February 28. Daylight saving time is observed at Halifax Stanfield International Airport during 2019, but it neither starts nor ends during February, so the entire month is in standard time. For reference, on June 21, the longest day of the year, the Sun rises at 5:27 AM and sets 15 hours, 36 minutes later, at 9:03 PM, while on December 22, the shortest day of the year, it rises at 7:49 AM and sets 8 hours, 47 minutes later, at 4:35 PM. The chance that a given day will be muggy at Halifax Stanfield International Airport is essentially constant during February, remaining around 0% throughout. For reference, on August 2, the muggiest day of the year, there are muggy conditions 15% of the time, while on January 1, the least muggy day of the year, there are muggy conditions 0% of the time. The average hourly wind speed at Halifax Stanfield International Airport is essentially constant during February, remaining within 0.1 miles per hour of 8.6 miles per hour throughout. For reference, on January 13, the windiest day of the year, the daily average wind speed is 8.8 miles per hour, while on August 6, the calmest day of the year, the daily average wind speed is 5.8 miles per hour. The hourly average wind direction at Halifax Stanfield International Airport throughout February is predominantly from the west, with a peak proportion of 44% on February 3. Halifax Stanfield International Airport is located near a large body of water (e.g., ocean, sea, or large lake). This section reports on the wide-area average surface temperature of that water. The average surface water temperature at Halifax Stanfield International Airport is essentially constant during February, remaining within 1°F of 33°F throughout. The growing season at Halifax Stanfield International Airport typically lasts for 5.7 months (175 days), from around May 2 to around October 24, rarely starting before April 15 or after May 20, and rarely ending before October 4 or after November 12. The month of February at Halifax Stanfield International Airport is reliably fully outside of the growing season. The average accumulated growing degree days at Halifax Stanfield International Airport are essentially constant during February, remaining around 1°F throughout. The average daily incident shortwave solar energy at Halifax Stanfield International Airport is gradually increasing during February, rising by 0.9 kWh, from 1.8 kWh to 2.8 kWh, over the course of the month. For the purposes of this report, the geographical coordinates of Halifax Stanfield International Airport are 44.884 deg latitude, -63.512 deg longitude, and 354 ft elevation. The topography within 2 miles of Halifax Stanfield International Airport contains only modest variations in elevation, with a maximum elevation change of 348 feet and an average elevation above sea level of 381 feet. Within 10 miles contains only modest variations in elevation (663 feet). Within 50 miles contains significant variations in elevation (1,181 feet). 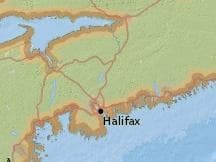 The area within 2 miles of Halifax Stanfield International Airport is covered by trees (72%), herbaceous vegetation (11%), and grassland (11%), within 10 miles by trees (87%), and within 50 miles by trees (57%) and water (35%). This report illustrates the typical weather at Halifax Stanfield International Airport year round, based on a statistical analysis of historical hourly weather reports and model reconstructions from January 1, 1980 to December 31, 2016. Halifax Stanfield International Airport has a weather station that reported reliably enough during the analysis period that we have included it in our network. When available, historical temperature and dew point measurements are taken directly from this weather station. These records are obtained from NOAA's Integrated Surface Hourly data set, falling back on ICAO METAR records as required. The stations on which we may fall back include but are not limited to Shearwater Airport; Shearwater Jetty; McNabs Island , N. S.; Truro, N. S.; Upper Stewiacke Rcs; Liverpool South Shore Regional Airport; Kentville , N. S.; and Parrsboro.